Blowout Sale! Free Shipping Included! Save 78% on the LG V30 Battery Case with Audio Jack Cable, ALCLAP 4400mAh Portable Charging Case Extended Rechargeable Power Charger Case for LG V30(6 inch)Battery Pack/Sync-Through Tech[USB Type C Cable Input]-Black by ALCLAP at DJ Luu. MPN: A-LG-V30-BC-BLACK-Mfr. Hurry! Limited time offer. Offer valid only while supplies last. ALWAYS POWER ON, NEVER OFFLINE ALCLAP 4400mAh LG V30 Extended Battery Case is designed to improve the performance and battery life for your LG V30 . ALCLAP 4400mAh LG V30 Extended Battery Case is designed to improve the performance and battery life for your LG V30 . The powerful 4400mAh high capacity charging case can add more than 130% Battery Life for your LG V30,help you enjoy more spare time, and quick full charge your LG V30 within 2 hours. Based on Smart Dual Charging & Syncing Tech, syncing your LG V30 to PC or laptop without removing the battery case.Also support to charge the LG V30 and battery case together.The case is programmed to let your LG V30 charge first, then transfer to charge the battery case automatically. Included a pass-through audio jack cable,which is made for 3.5mm headset audio input,extends the reach of any 3.5mm headphone. 360°ABS+TPU full edge protection provide the great safety guard to your LG V30, which can help protect your phone from daily bumps and scratches. Precise cutouts,so that the ports for charger,camera,volume button and other features can be accessed without much hindrance. The smart internal chips of this LG V30 battery case helps deliver only the right amount of power of fast and safe charging. Not designed to screen protection & wireless charge. When charging the battery case with phone attached, the phone will be charged first. After the phone is fully charged, battery case will start charging. When your LG V30 is fully charged, turn off(press the power button 3 seconds) it so as to save capacity of the built-in battery. 【PROVIDE 130% EXTRA BATTERY LIFE】: ALCLAP 4400mAh lithium polymer lg v30 battery case provides up to 130% extra battery life for your LG V30,which is equivalent to add 21 hours talk time, 11 hours gaming and 15 hours web browsing time.Fully charge your LG V30 within 2 hours. 【ADVANCED CHARGING &SYNCING TECHNOLOGY】: Equipped with Smart Dual Charge & Sync Tech,you can charge the LG V30 and charging case together with original usb type c cable. And NO need to remove the charging case when syncing your LG V30 to Mac book, PC or laptop. 【PRECISE CUTOUTS】&【SAFETY CHARGING】: Perfectly cut outs for all the LG V30 switches, button,camera and other features(Audio jack cable included). 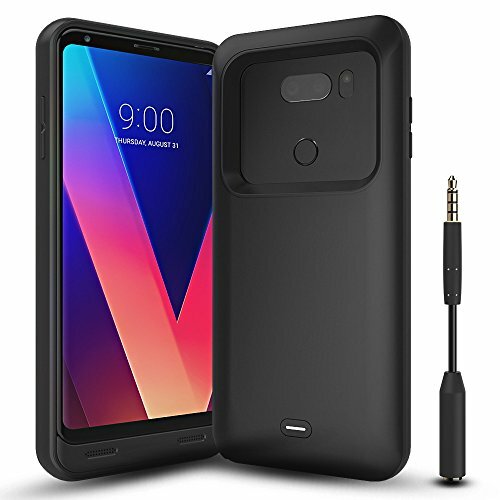 The IC circuit of this LG V30 charging case will protect your phone from overheating, short circuiting and over charging. ★★★★★【100% Lifetime Guarantee】If you are not satisfied with your LG V30 battery case, please contact us and you will be offered a refund or replacement. Enjoy this absolutely RISK FREE purchase by ALCLAP. If you have any questions about this product by ALCLAP, contact us by completing and submitting the form below. If you are looking for a specif part number, please include it with your message.